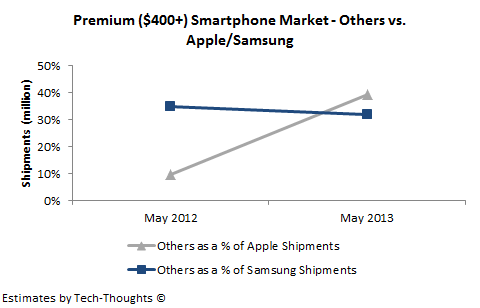 According to Counterpoint Research, Samsung has overtaken Apple in the premium ($400+) smartphone segment. Samsung has grown its share from 20% to 47% from May 2012 to May 2013, while Apple's share has dropped from 73% to 38% during this span. Let's take a deeper look at these figures. The figures above are slightly misleading because the Galaxy S3 launch occurred at the end of May 2012, while the Galaxy S4 launch occurred in late April 2013. Therefore, Samsung's market share in May 2012 is much lower than expected and the growth looks more pronounced. While this does not affect the overall dynamics in the market, we may be able to get a better picture if we had a look at shipments instead of market share. Since all current iPhones are priced above $400, we can use the market share chart with quarterly shipment data to estimate the size of the premium smartphone market. For May 2013, we can use my iPhone shipment estimates as a base. As the chart above shows, iPhone shipments are virtually unchanged over the past year, while Samsung's shipments in the $400+ segment have seen strong growth. This is to be expected as Samsung's combination of branding and large screen smartphones are a much better fit the premium mobile computing usage segment. The interesting part here is the growth of the "Others" segment, i.e. vendors other than Apple & Samsung. The chart above shows the ratio of premium ($400+) smartphone shipments from other vendors to Apple's and Samsung's shipments. 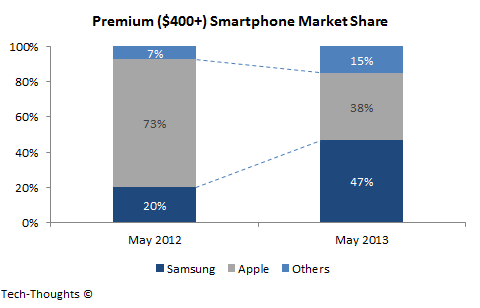 While the share of "Others" in the premium smartphone market doubled from 7% in May 2012, to 15% in May 2013, the pattern with respect to Apple & Samsung is quite interesting. 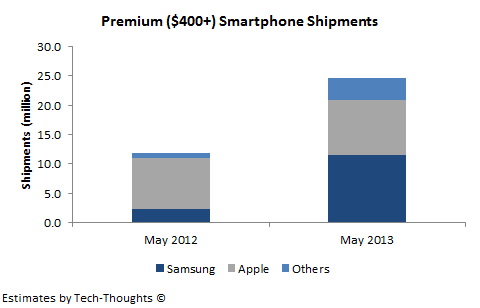 In May 2012, premium smartphone shipments from "Others" were just 10% of Apple's shipments and about 35% of Samsung's shipments. By May 2013, the shipments from "Others" had grown to nearly 40% of Apple's shipments and remained at 32% of Samsung's shipments. This clearly highlights that the "Others" have maintained Samsung's growth pace, even after taking into account the late S3 launch, and have far outpaced Apple's growth. Even though Q2 is usually one of the iPhone's weaker quarters, the significance of this trend cannot be overstated. It is important to note that this data is based on May shipment figures, i.e. the first month of Galaxy S4 shipments. There have been reports that demand for the Galaxy S4 has been slowing faster than expected, similar to the trend we saw with the iPhone 5. Therefore, the figures in subsequent months could be even more skewed towards the "Others". However, the most important factor to note may be the state of the $400+ smartphone market itself. As I mentioned in the "Profit Share Trap", the biggest threat to Apple & Samsung is from "good enough" smartphones from smaller vendors. In the early stages, this competition may come from $400+ smartphones, but as we move forward, I expect to see greater cannibalization from lower priced phones ($250-$350). This means that the $400+, premium smartphone market may begin to lose its relevance in a year.